Part of this year's #slimejam. It ain't all that special, tho. I only had around 2 days left to make this so I made this, well, veeeery simple. And with some bugs. 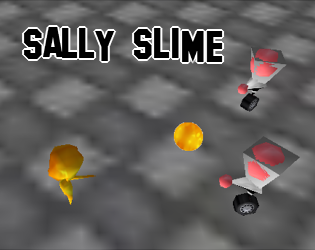 Keep your slimegirl Sally as long as possible by defeating waves of robotic Drones. For every robot you destroy, you gain +5 time. Your goal is to get the highest score. The 3D Engine's created by TheSnidr https://forum.yoyogames.com/index.php?threads/snidrs-model-format-3d-collisions-... - I used the only version available for Game Maker Studio 1.4. If you have GMS1 or GMS2, you could check it out and take it a spin. Note that for now, Snidr's updating the versions only for GMS2. The 3D Models are done by me.